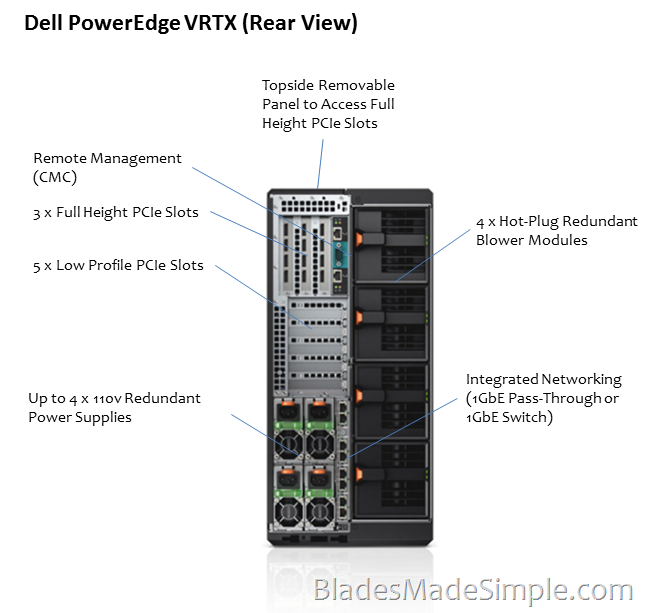 The first thing you might say when you look at the PowerEdge VRTX is “this is just Dell’s entry into a small blade chassis.” While that may appear to be the case, the Dell PowerEdge VRTX offers something that no other blade server solution offers (without eating up blade server slots) – the ability to use regular, rack server PCIe cards. Yes, you read that right. Dell has found a way to combine the density of blade servers with the flexibility of rack server I/O options with PowerEdge VRTX. This means you have the flexibility to use less expensive PCIe cards giving you a plethora of choices all while being managed through shared chassis management. So enough small talk, let’s dig into what’s under the covers. 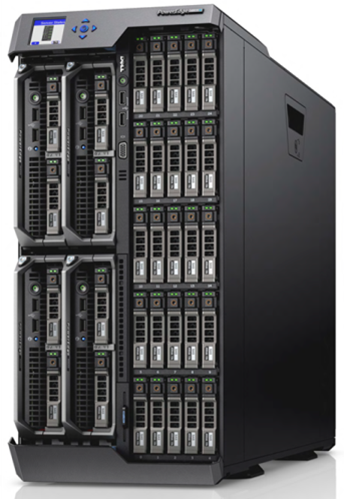 The PowerEdge VRTX can hold up to four server nodes and up to 25 x 2.5” hot-swap drives offering up to 3TB of RAM, 64 processing cores and 48TB of storage. 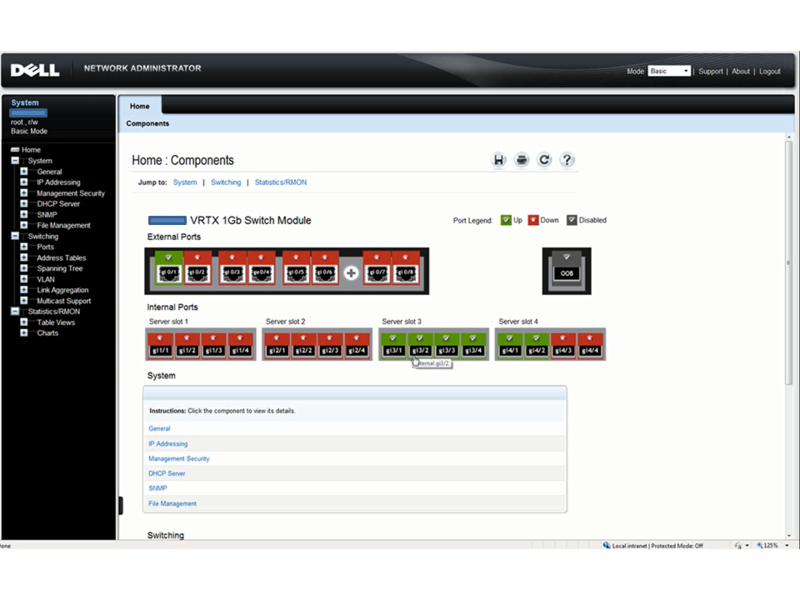 In addition to the 2 – 4 ports of on board networking, the PowerEdge VRTX also offers I/O expansion via 8 shared PCIe slots (3 Full-Height, 5 Low-Profile). The PowerEdge VRTX is available as a tower model as shown above, but it can also be racked (5U in size) with the addition of the optional rack mount kit. 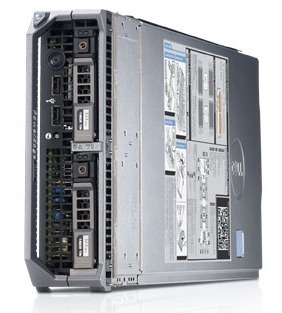 M520 server node – Up to 2 x Intel Xeon E5-2400 CPUs, up to 384GB of RAM, 4 x 1GbE NICs You can find the full specs at http://www.dell.com/us/business/p/poweredge-m520/pd?~ck=anav. If you noticed there was no mention about the mezzanine cards that you typically find in Dell blade servers, there is a reason for that. 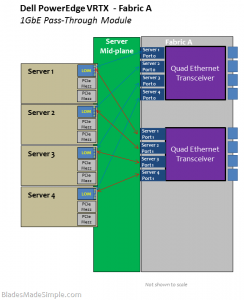 They are not used for the traditional I/O expansion via external fabrics. Instead they are used for connecting to the PCIe infrastructure. More on this below. 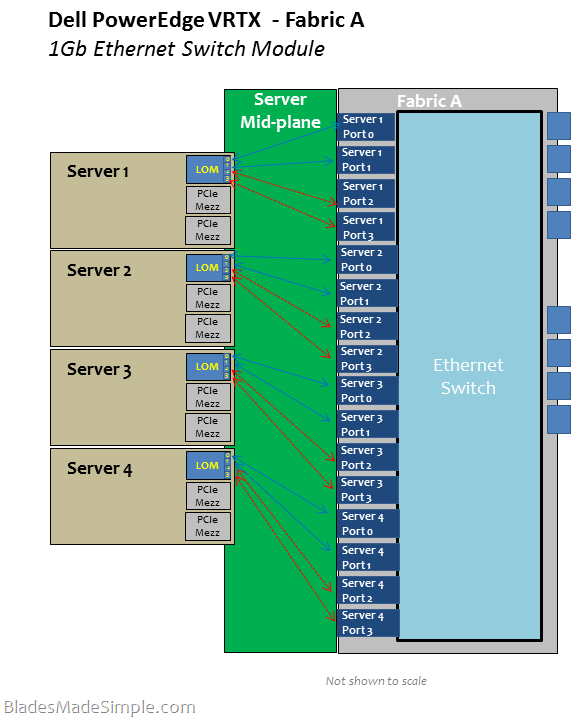 After you spend a few minutes studying the diagram, one of the things you might notice is that there is only one I/O fabric – Fabric A. I’m going to review Fabric A shortly, but first, focus on the mezzanine card slots on the server nodes. 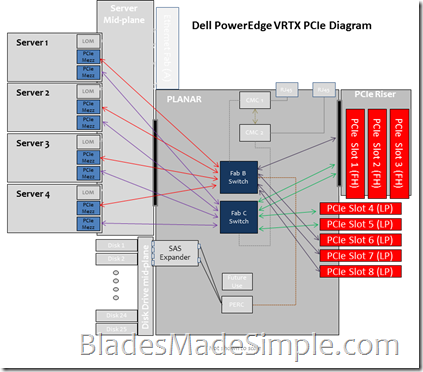 Instead of using traditional I/O modules for Fabric B or Fabric C, Dell has designed the PowerEdge VRTX to use PCIe slots. 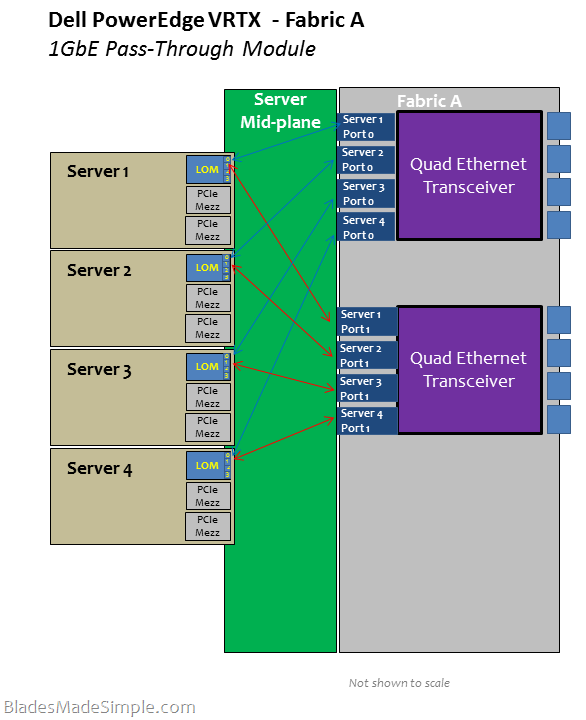 This is done via two PCIe switches – one for Fabric B and one for Fabric C. Each PCIe switch ties into one of the two mezzanine cards on the server nodes as shown in the diagram below. 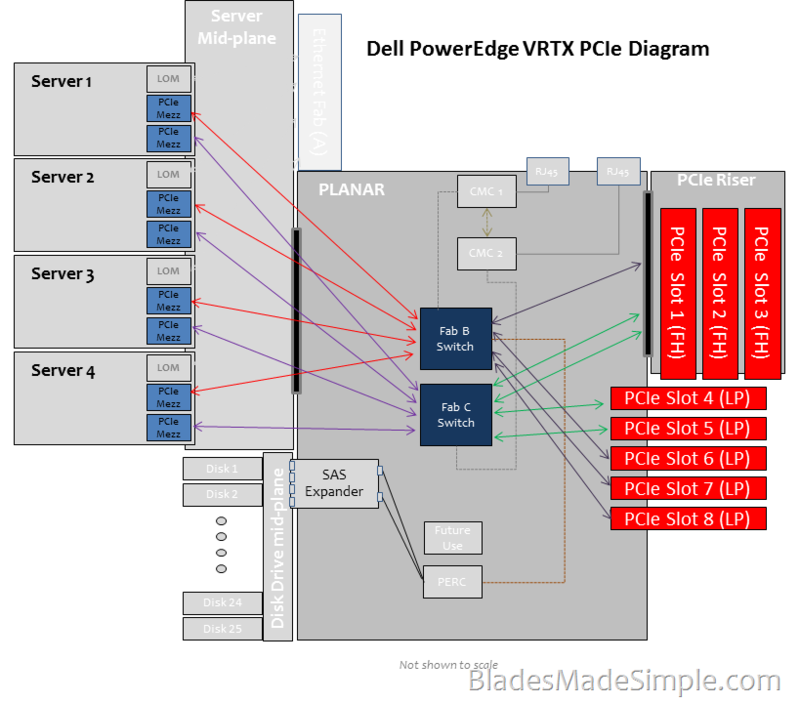 The PCIe slots are non-shared and thereby dedicated to one server node within the PowerEdge VRTX system. 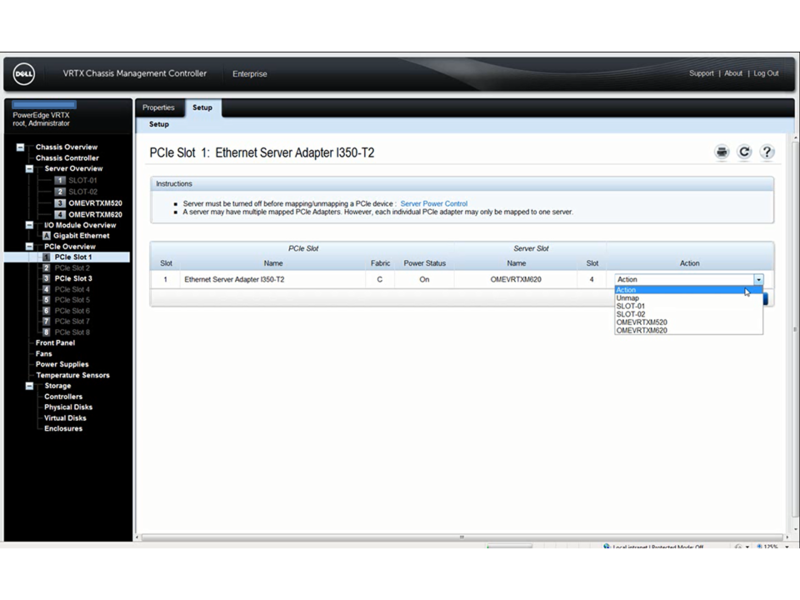 The PCIe slots can be re-assigned to a different server through the CMC as needed. Each slot is capable of being exclusively assigned to any blade server, although it does require powering the server node off. I’ve got a screenshot of this later in the management section. As you take a look closer at Fabric A, you notice that the same fundamental principle applies as in the Dell PowerEdge M series blade servers – the onboard networking, or LOM (LAN On Motherboard), directly maps to Fabric A. The difference, though, with PowerEdge VRTX is that there is a single fabric A. Why only one? The answer lies within the target audience of this solution – remote office / branch office. 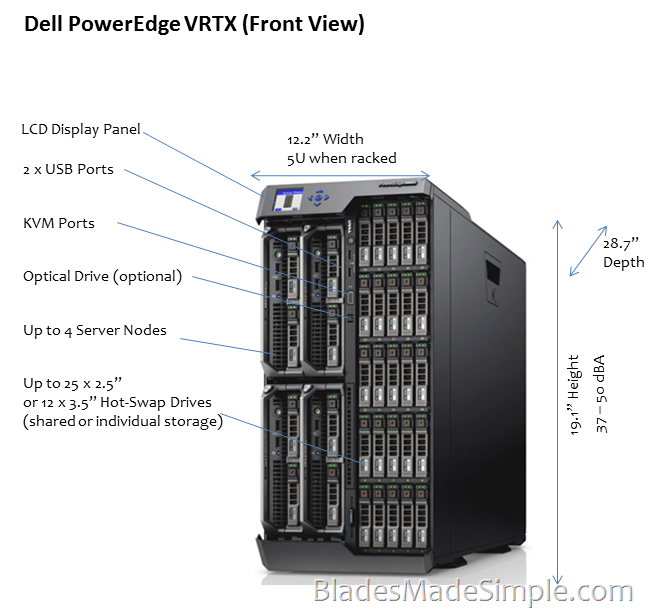 Throughout the 7,700 customer conversations Dell had during the planning phase for PowerEdge 12th generation servers, it was conveyed that remote and branch offices don’t typically use or need redundant top-of-rack switches, so to reduce costs, PowerEdge VRTX has a single network fabric. At product availability, there will be two options – a Pass-Though Module and an Ethernet Switch Module. 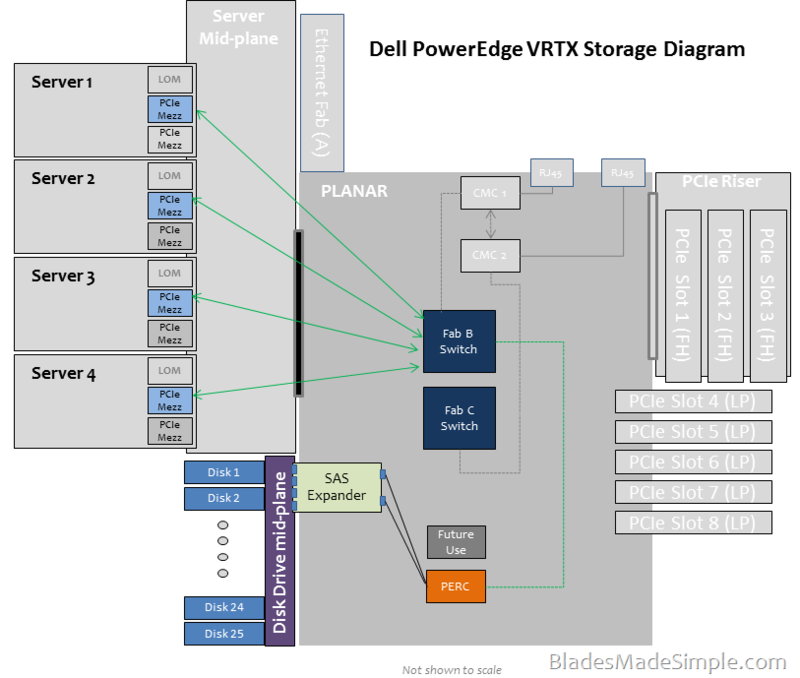 One of the key advantages that PowerEdge VRTX offers is integrated, shareable storage. 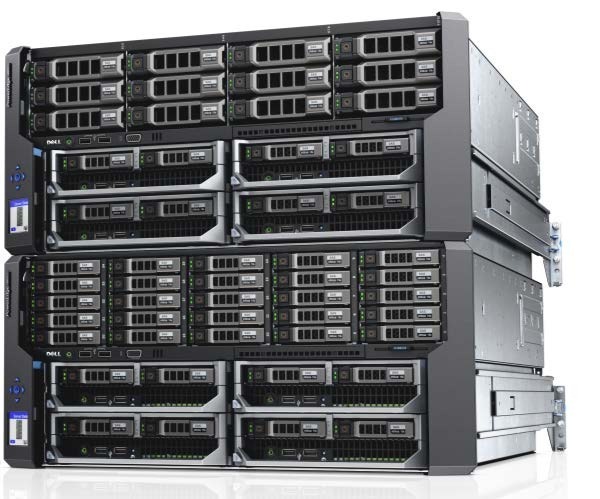 PowerEdge VRTX supports either 12 x 3.5” hot-swap drives or 25 x 2.5” hot-swap drives (determined at purchase). 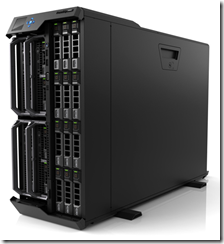 The drives are supported by a shared PowerEdge RAID Controller, or SPERC. The shared PERC8 is connected to each server’s mezzanine card through the PCIe switch and feeds two x4 mini-SAS connectors to the storage subsystem. 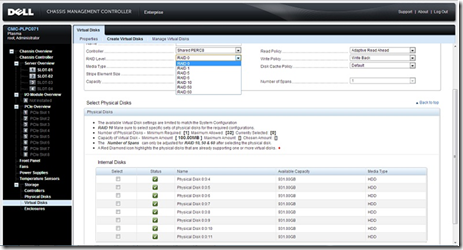 The chassis management controller, or CMC, allows for the user to create virtual disks which can be assigned to a single server node, or across multiple server nodes. Since the storage is shared, each server node will see the storage as its own singular storage pool. 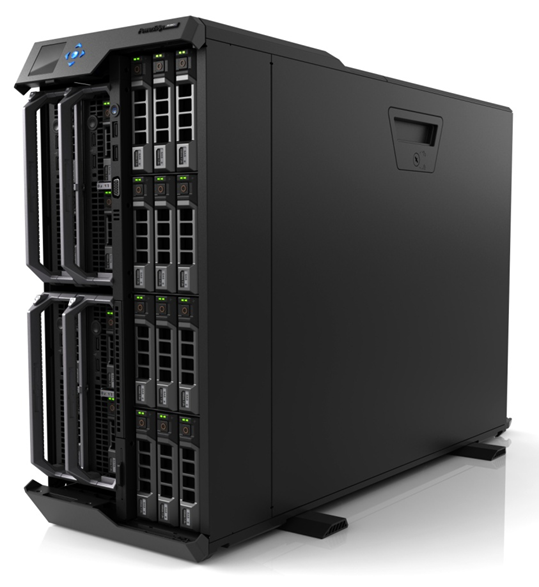 The Shared PERC8 will offer RAID 0, RAID 1, RAID 5, RAID 6, RAID 10, RAID 50 and RAID 60 as well as options like hot-spare. The last section to review is management of PowerEdge VRTX. 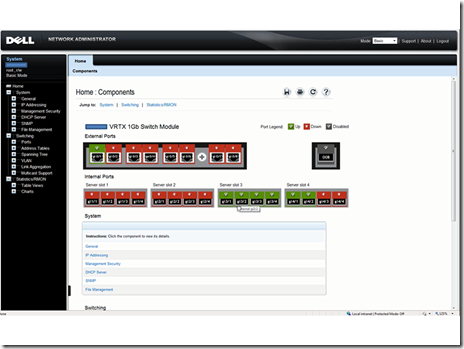 As stated above, the PowerEdge VRTX uses a chassis management controller, or CMC, to manage the system. 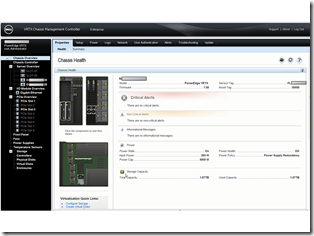 This includes management of server nodes, the power, cooling and the storage and PCIe subsystems. 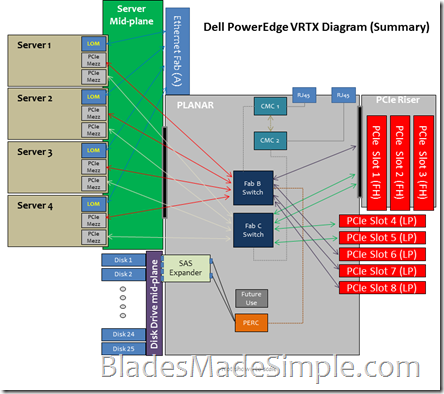 It is important to note, that the PowerEdge VRTX CMC is not the same CMC as you might find in the PowerEdge M1000e. The firmware is different and provides additional functionality not found within the M1000e, but if you are familiar with the CMC of the PowerEdge M1000e, the PowerEdge VRTX CMC should look familiar. 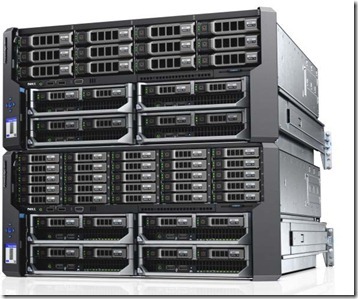 As with the M1000e CMC, the VRTX CMC allows for management of up to 9 PowerEdge VRTX chassis – anywhere on your network. Additionally, with the addition of the free Dell Open Manage Essentials software, users can visually pin point the locations of the PowerEdge VRTX systems (known as GeoView). 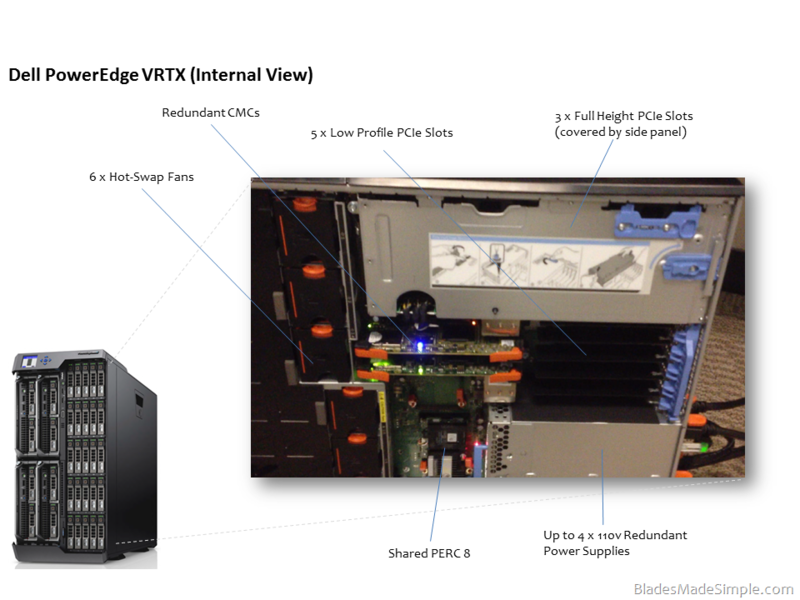 According to my sources, the PowerEdge VRTX will come standard with an Enterprise license for the CMC. However, there may be customers who won’t need the advantages the Enterprise license offers, so for those customers, an “Express” offering is being planned. 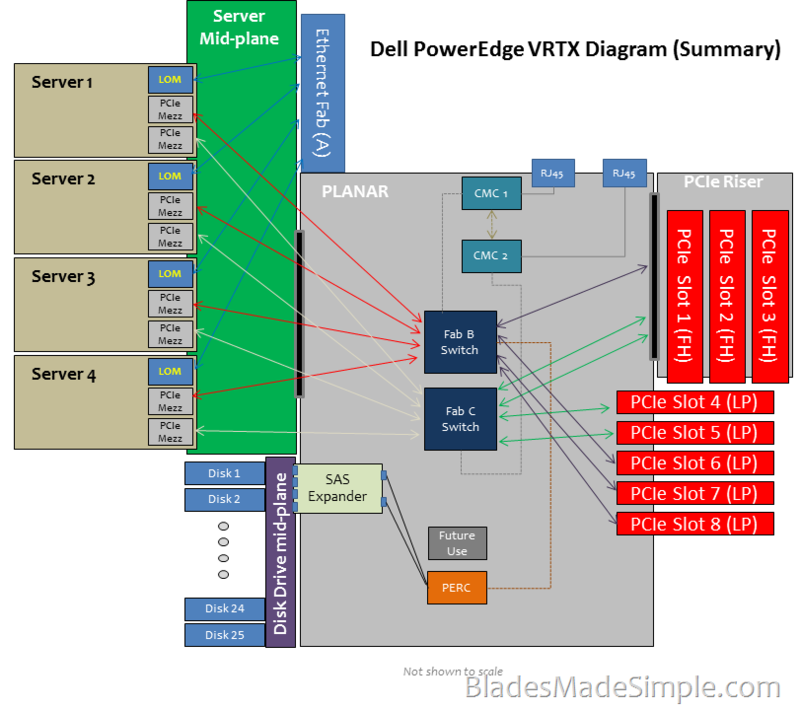 PowerEdge VRTX is a lot different from what I speculated back in April of 2011 (http://bladesmadesimple.com/2011/04/dell-to-introduce-a-new-mini-chassis-for-blades/). 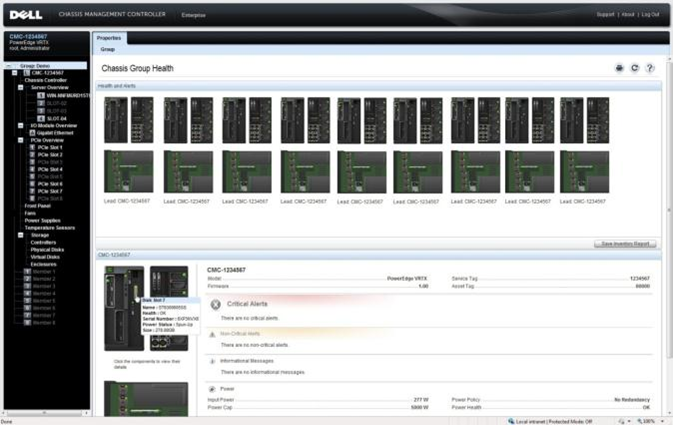 It offers remote and branch offices the flexibility of a data center in a box. 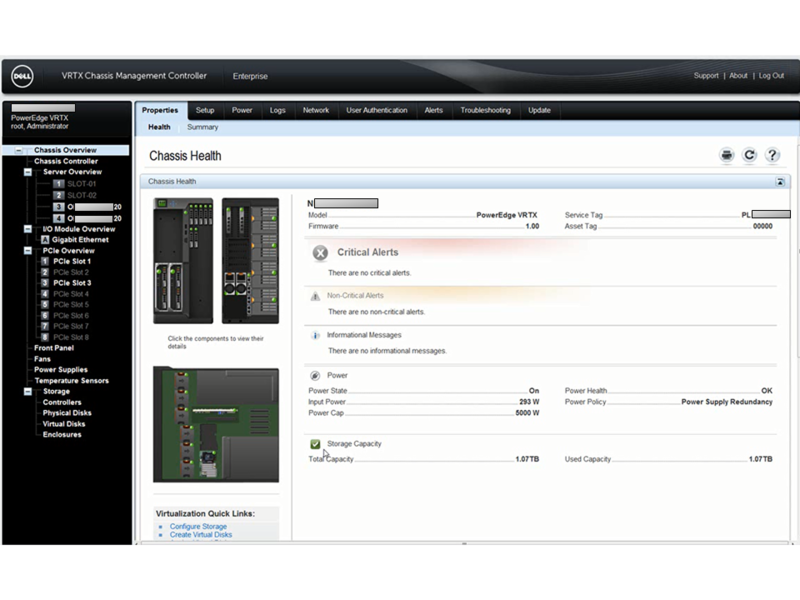 It includes high-performing servers, integrated storage, networking and management. Since it is a modular design, you can easily scale with your remote office needs. 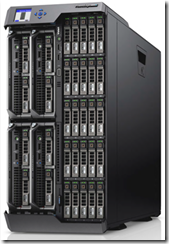 PowerEdge VRTX is currently scheduled to available for shipping June 25, 2013 in the United States and globally shortly after.